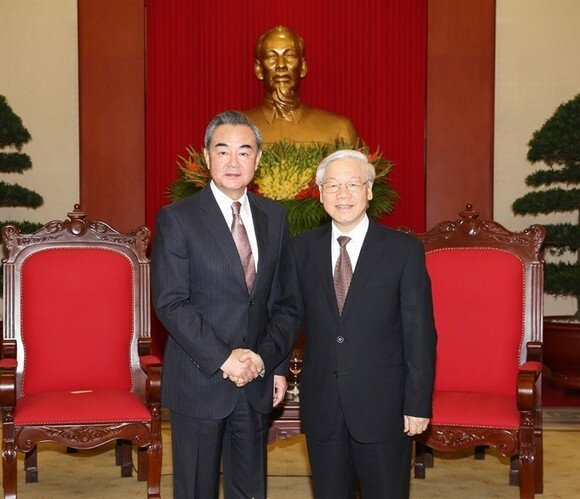 Party General Secretary Nguyen Phu Trong yesterday hosted a reception in Hanoi for Chinese Foreign Minister Wang Yi. He stressed that the Party and State of Vietnam always pays great attention to fostering and promoting the traditional friendship and comprehensive strategic cooperative partnership with China. The Party chief welcomed the upcoming visit to Vietnam by CPC General Secretary and President Xi Jinping and his attendance at the APEC Economic Leaders’ Meeting. Wang Yi, who began a three-day official visit to the country yesterday, affirmed that the Party, State and people of China always attaches great importance to developing their traditional friendship with Vietnam. He also noted that Vietnam and China share many similarities in their development ideals and paths, and in their desire to create favourable conditions to strengthen practical cooperation in all fields, benefiting the people of both countries and promoting peace, stability and prosperity in the region and the world. Wang Yi said that CPC General Secretary and President Xi Jinping’s State visit to Vietnam and his attendance at the APEC Economic Leaders’ Meeting was his first trip abroad after the 19th CPC National Congress, showing the Chinese leader’s and CPC’s special sentiments towards Vietnam. He said this would enhance political trust and respect for each other’s legitimate interests and facilitate proper settlement of existing issues in bilateral relations.